1,000 Tamper Evident Holographic Bright Black Security Label Seal Sticker, Rectangle 2" x 0.75" (50mm x 19mm). Custom Print. >Click on item details to customize it. *Film designed with temperature rating performance adhesive of -65 Deg F. to +200 Deg F. available in the market at affordable prices, guaranteed!!! *Unique authentication solution with customization capability features to support design, branding and security objectives. * Service temperature -65 Deg F. to +200 Deg F.
250 Tamper Evident Hologram Bright Black Security Label Seal Sticker, Rectangle 2" x 0.75" (50mm x 19mm). Custom Print. >Click on item details to customize it. 5,000 Tamper Evident Holographic Bright Black Security Label Seal Sticker, Square 1" x 1" (25mm x 25mm). Custom Print. >Click on item details to customize it. 1,000 Tamper Evident Hologram Bright Black Security Round Label Seal Sticker, Round/ Circle 0.5" diameter (13mm). Custom Print. >Click on item details to customize it. 5,000 Tamper Evident Hologram Bright Black Security Label Seal Sticker, Rectangle 2" x 1" (50mm x 25mm). Custom Print. >Click on item details to customize it. 500 Tamper Evident Holographic Bright Black Security Label Seal Sticker, Square 1" x 1" (25mm x 25mm). Custom Print. >Click on item details to customize it. 500 Tamper Evident Hologram Bright Black Security Round Label Seal Sticker, Round/ Circle 0.5" diameter (13mm). Custom Print. >Click on item details to customize it. 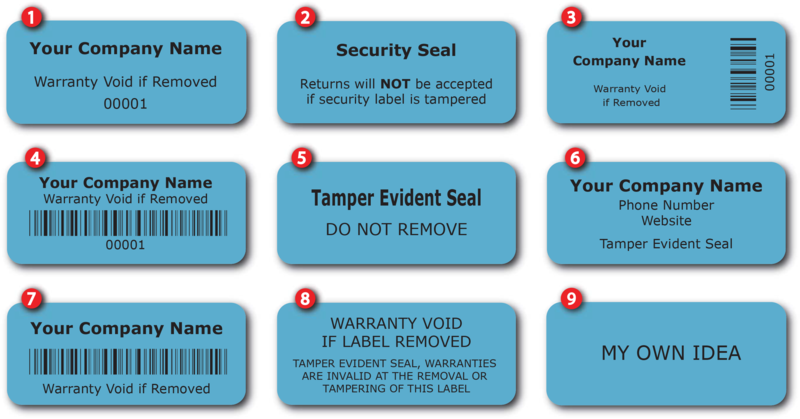 500 Tamper Evident Holographic Bright Blue Security Label Seal Sticker, Square 0.75" (19mm). Custom Print. >Click on item details to customize it. 5,000 Tamper Evident Hologram Bright Black Security Label Seal Sticker, Rectangle 1" x 0.375" (25mm x 9mm). Custom Print. >Click on item details to customize it.